Seabirds, coastal birds and waders, opportunistic feeder or diver, edible or inedible, aggressive or passive, Skua or Guillemot, let us start at sea and slowly come ashore. With our rocky islands, steep or vertical cliffs, well provisioned waters full of food, we are a natural haven for seabirds of all kinds. With all species the activities and reappearance of many species starts in April as the birds pair up and nesting sights are reclaimed or selected. My own particular delight is the reappearance of the puffins and guillemots out on the islands. There is a large colony of puffins off the western shore of Inishturk which every year gives the greatest of entertainment to even those on the boat who never considered the attraction of bird watching. 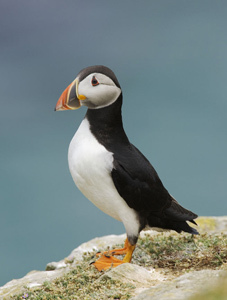 The comic characters are the Puffins who make their ‘nests’ in burrows on the cliff tops, as secure an environment as can be imagined for their eggs and chicks. While one of the couple incubate, the other will be in the water below the cliffs fishing for sand eels and having collected sufficient in their beak, will carry those back to their cliff top refuge. Their attempts to take off from the water are on many occasions very entertaining. The birds busily flapping their wings and paddling like fury with their webbed feet, then part way airborne, running along the uneven surface of the water and occasionally hitting the top of a wavelet and somersaulting back onto the surface with a very undignified crash landing. Two hundred gathered together make for a lot of crash landings. They are partnered by Razorbills and Guillemots, all finding space to nest and find feed for their chicks as they emerge from under the body or wing of the attendant parent. Finding their own precarious perches on the cliff sides and ledges are the Fulmars. A gull type bird, shorter in body to the Herring gull, quite rotund in a avian fashion with narrow long wings which defy its suggested lack of agility and give show to a wonderful array of acrobatic skills that few in the seabird community will match. These birds seldom land on anything other than the ocean surface or their rock ledges and so walk only on their elbows. A curious trait but if on finding and injured one you rescue it, don’t think it a cripple as I once did. Below the Fulmars one can find strung along the wider ledges and rock tops a collection of Shags and Cormorants, often to be seen with their wings part opened in order to dry them in the breeze. These are diving birds from the surface and will manage to achieve some spectacular depths in their pursuit of food. Dark browns and greens with the mix of black feathers and in the case of the Cormorant a white bar to its face and tummy, a hardy member of the seabird species. The principal divers and often the most dramatic of our seabirds are the Terns and Gannets. The Tern coming in at least five variants, often to be seen hovering with a very fast wing speed while seeking an opportunity to dive on their quarry, their overall shape one that could have been designed by Pininfarina or R.J. Mitchell. Then a short fifty foot plunge with wings folded gives them an appearance of a superbly streamlined dart, their immersion in the water very brief and then a fast ascent to their post some fifty feet above the waves. Gannets, my own personal favourite, principally white, black tips to the adults wings and a pale yellow head. We have watched these birds for many years now and still I admit to a fascination for their plunge into oblivion. Starting sometimes from 200 feet above us, these great fishers use their superb eyesight to seek out their quarry and then stoop in a vertical dive, wings folded, huge bill arrow straight out in front, a splash at 60 mph, and they disappear below the waves, sometimes swimming for several seconds to reach their intended meal and then turning for the surface and the air above. When seen in big numbers like off the Skelligs they have been filmed below the surface with this succession of bomb bursts through the water and streams of bubbles following them down to the shoal they have targeted. A admirable bird and a very brave and very skilled flier. This is just a flavour of what is out there to be seen. Not only are there the great variety of birds out around the islands but so too, the shore feeding birds who depend on the sandy beaches and brackish waters of low ground along our main shore line, sandpipers, curlew, oyster catchers a variety of geese and swan to name but a few. Both out at sea and on the coast too are so many species of gull including the Kittywakes, Herring gull, Great Black Backed gull and more. With all those you will see a variety of Shearwaters, Petrels and Duck. Bring a bird book or let us identify the species for you while you capture them on your camera or through binoculars. One of our great artists and devoted countrymen, Douglas Anderson, is available to come out on the Brazen Hussy when we are visiting the bird colonies and shore lines in search of as many different species as possible and is most adept at identifying those that fly within range of our vessel. 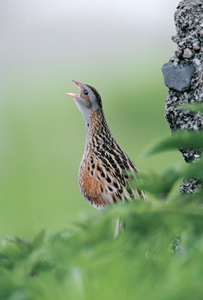 Finally just one other possibility looms to whet your appetite which is achieved by a lunch time visit to the island of Inishbofin where seated at an outside table, you may enjoy the rasping call of a Corncrake and as was the case mid summer last year, watch it calling from the top of a small haycock.